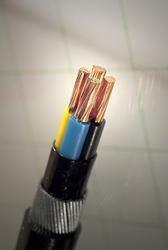 Pioneers in the industry, we offer control cable from India. At Relicab cable With the implementation of latest technology, we are able to offer Control Cable. The cables that we offer are used for flexible use of medium mechanical stress with free movements in wet, dry and moist conditions. These cables are not appropriate for open air, as measuring cables, conveyor belts, tool machine and many more. The cores of these cables have been numbered in such a way that there is no difficulty in identifying them. The numbers have been underlined to avoid confusion if any piece of the sheathing is removed. In the outer layer of the cable, the earth core has been laid. These offered Control Cables have fast and easy installation.